Description: This design connects three hexagonal pods or modules that can be arranged in various configurations using more or fewer pods. This enables the home to be built one stage at a time. The bonus room in the Double bedroom pod can be used as a study, etc. The bonus room in the Master bedroom pod can serve as a home office, guest room, etc. Here’s another configuration using two pods. Update: These plans are being used on multiple projects, including one in Uganda. An NGO there have adapted the basic design for their situation. Below is an illustration of the right half of the Two Pod design, which will be built in two stages (right, left) and feature many appropriate technologies. They’ve added an outdoor porch with two rocket stoves and oven, and a solar wall oven to keep heat out of the house. I’ve often thought about linking hexagonal shapes. i like the way you added a square connecting shape. Very flexible design that could be easily adapted to varying terrain. Is it possible to purchase the plans for the 3 hexagonal pod above??. 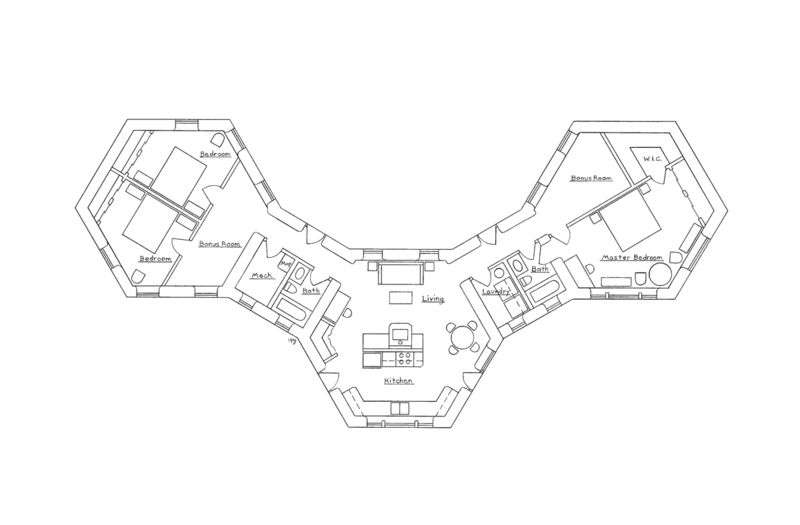 I would also like to know if you can add an additional two bedroom pod between the left and right pod and above the main pod so I would have 4 bedrooms and 1 master bathroom. Please let me know how to purchase the plans with the modifications stated. We would like to begin building as soon as possible on our organic farm. Just about anything is possible as far as configuring extra pods. I’ll email you the details. I just found your site totally by accident through StumbleUpon but I’m really glad I did! I’ve always been interested in “non-traditional” housing and I have never heard of earthbags until now. I really like that fact that there can be so many smooth curves and you can let your imagination go wild when you are designing one of these houses. I also love that these houses could be built as completely accessible because I’m a blind wheelchair user. 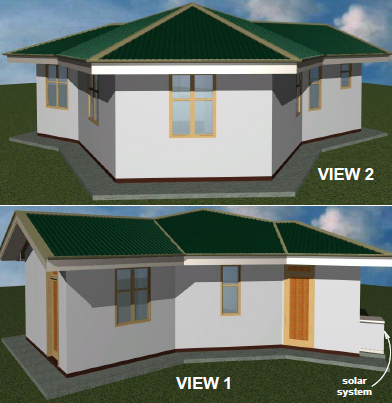 In traditional wooden houses floors are level and connected with ramps or elevators but I just thought with these types of houses wouldn’t you be able to go from one elevation to another with a sloped floor that is just designed right into the house? I also really like that you can just easily design the house to be built onto when your family grown so you don’t have to awkwardly built onto your house, add rooms to the basement or move when that happens. You can live in your home for many many years with a growing family. Yes, this plan has all these characteristics. It is highly flexible and currently one of my most popular plans. I have been looking at different designs you offer through earthbagbuilding.com. I like your style.. We have just started a 14ft, project dome here in central Texas. I like the idea so much my wife and I have decided to build one to live in. We have five children and needed something bigger. The pod system is perfect.. Just not big on the hexagon shape. We would like to build with the dome shape. You had a pod design that was circular made from 5 hexagons. We want that same design with domes and rounded connecting sections. 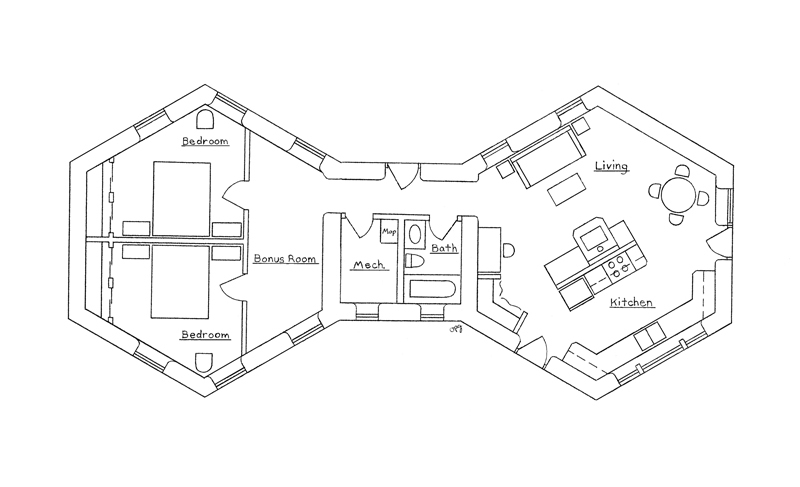 Is it possible to get detailed plans for something like that? And at what cost? Thanks for the input. The cost is the same: $200 for two pods, $300 for three pods. Vaults would connect the domes, and the floorplans would be nearly identical. There’s an extra charge if you want to change things around, usually about $100. Hello, I live in the Austin Texas area and I am wondering what restrictions there are for Earthbag homes. My husband and I want to do this ourselves without the expense of a contractor, although we realize we will most likely need and want some help. Can anyone out there tell me who to contact to find out specifics before I buy my land? I will most likely want to build in Travis, Williamson or Burnet County. I’ve heard that rural areas of Texas are very lenient and will allow earthbag building. But you’ll have to check county by county to be sure. Ask each county’s building officials what their codes allow. Take Doni and Kaki’s Earthbag Building book and some test reports from EarthbagBuilding.com: http://www.earthbagbuilding.com/testing.htm and maybe some articles: http://www.earthbagbuilding.com/articles.htm. Read up on things so you can answer their questions. Publish some new plans ,your work is good keep it at that. thanks for the plans ,send me new semi detached plans for three bed rooms. I have decided the next home I build is going to be as green and healthy as possible. I also want to make it as affordable as possible, and the work you are doing is very exciting. In terms of “do it yourself”, how much more difficult are the pods than domes, and how is the roof constructed? Is it something I could do myself with friends, or is it something I’d really need a contractor for? Is it designed expressly for solar collection? Can it be done with all green and recycled materials? I am very drawn to the 3 pod plan. Can you give me a rough estimate of cost for materials? Thank you, and keep up the inspiring work! In some ways vertical walls are easier to build than domes. Domes require maintaining a uniform corbel, whereas vertical walls are just stacked straight up. You could build a wood bond beam (easiest) or concrete bond beam (strongest). The roof can be built in various ways. The easiest is to purchase factory made trusses. You could build a reciprocal roof with poles. You’ll need to itemize all the materials in a spreadsheet for an accurate cost estimate and plug in local costs. But but a rough idea, the 176 interior square foot roundhouse we’re building now will cost about $2,000 in materials. Details coming soon on our Earthbag Building Bllog. Sure, you can put solar on the roof. Wrap-around porches are very good. They provide extra space at low cost, protect the walls from moisture and help reinforce the main house. 2nd story designs are not ideal for heavy materials like earth. Trying to do this part time with a small crew is not recommended. You’ll want a tractor or some way to move the soil higher on the wall. Instead of one large pod, why not build two smaller ones if you have the space. Or maybe build the center pod, then the porch, then enclose the porch, etc. Do it in stages. And don’t rely on tarps. They tend to rip and blow away. Multi-year projects like you’re proposing are not ideally suited to earthbag. You’d have to stabilize the fill material with lime or cement, etc. So either build small, build in stages or use a faster, lighter weight building system. Yes, if it’s built correctly with sufficient number of posts and adequate sized beams. You’d have to plan for this. Hi I’m thinking off building a 6 pod unit in Thailand, Have any of your customers built one out there before, I believe Plans etc have to be redrawn and approved by a Thai architect before planning permission will be given for a none standard design. How detailed are your plans, do you foresee any problems. Also if this is an option I’d have all hexagonal and box walls the same 15ft or 5m. (Not sure which yet) and have the box sections between all the hexagons. One of the larger size box sections would make a good garage and you can never have enough storage space. You shouldn’t have any problems. Building codes are very lax in Thailand. What they’re asking for is likely just a formality of showing them finished drawings. If you have any trouble finding an architect, let me know. They’ll likely accept plans from Thai draftsman. Custom plans like you describe are available at a modest fee. Email me at strawhouses [at] yahoo.com. I’m looking at building a lake cabin in Minnesota. Any experience with codes there? Also, would it be possible to connect a traditional structure to an earthbag structure? Codes: You’ll have to talk to locals. Strike up a conversation with a local carpenter. And then talk to your building officials to get both sides of the story. Yes, it’s easy to join earthbag structures with other structures. Also note, you’ll want to add insulation on the outside of earthbag walls.